James O'Rourke was born Jul 7, 1894, presumably at home in Ballintur Townland, Kilbroney, County Down, the son of Francis Rourke and Sarah Brennan. 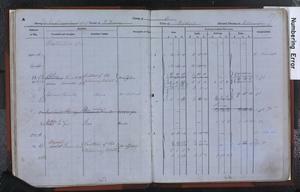 In 1901 he and his parents were living with his grandparents James Rourke and Mary Hughes in house 18 in Ballintur. 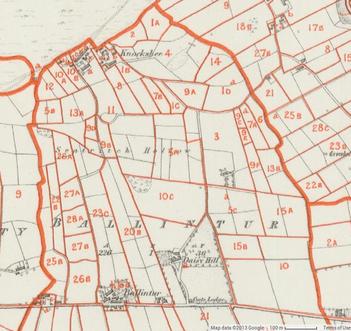 I believe this family occupied parcels 1A, 1Ba, 1C,and 1Da in the townland. Before we get back to Michael O'Rourke's family, we need to say a few words about the family of his wife, Mary McNally. It looks to me like Mary McNally was born in the fourth quarter of 1876 in the Stockton Registration District of Durham, England, and was baptized in Pontop, Durham, England, on February 11, 1877. While looking through some other O'Rourkes in Cleveland, I came across first James then Henry O'Rourke and filed them in the "mysteries waiting to be solved" category. As soon as I started working on them I realized they were father and son. Here is a brief account of both of them. 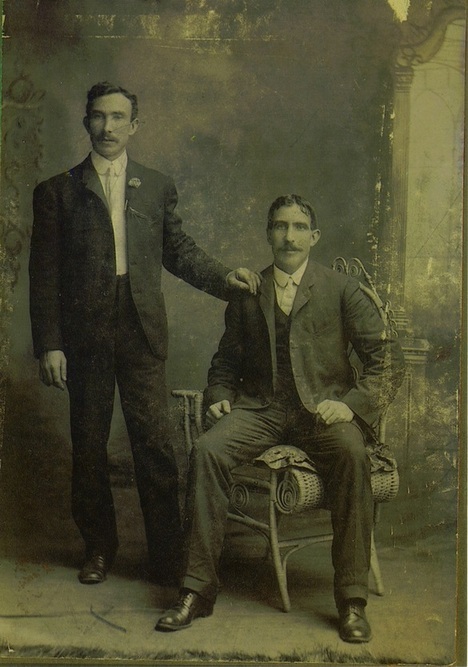 On 9 Jun 1900, James O'Rourke, son of John Rourke and Ellen Rodgers, arrived in the United States aboard the HMS Campania, which had left from Liverpool. He was on the way to his brother William's home on Harvard St. in Cleveland. While looking for the John O'Rourke who came with my grandfather from Killowen to Cleveland, I found another John O'Rourke in Cleveland instead. This man and his brother Henry were from Kilkeel. The evidence is a bit circumstantial, but I think it is solid enough to put the family together. 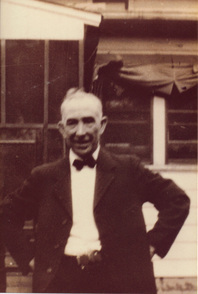 When my grandfather William O'Rourke emigrated from Ireland in 1899, he was accompanied by a John O'Rourke age 37. He was a single man who said he was from Ballintur Townland, County Down, as was my grandfather. John had been in the United States before, and had been a citizen for six years. John Rourke of Ballintur Townland, County Down, Ireland was baptized on January 19, 1827, likely at Killowen Chapel. He was the son of James Roarke and Nancy Colgan. The sponsors at his baptism were Patrick Doran and Mary Colgan. John's sister Margaret had been baptized in 1822 and his brother Edward in 1824. Just because a man's name is O'Rourke doesn't mean he is from Killowen, County Down. But if he is living on the East side of Cleveland in the early 1900′s, and has an aunt named Mrs Farron, you start to get "suspicious." So it went with this man, whom I came across while working on my own O'Rourkes. Michael Rourke and Alice Cunningham of Killowen, County Down, Ireland, had at least seven children. 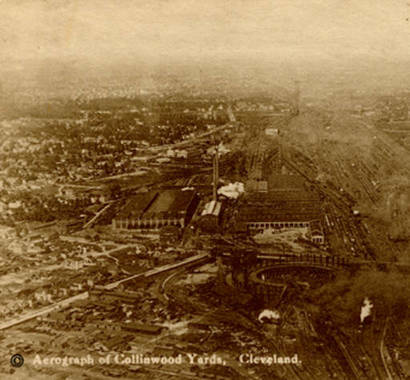 Three of their daughters emigrated to Cleveland, Ohio. Let's discuss them first, since we have referred to them earlier in this series of articles. In the merry month of June 1899, William Rourke salutes his father dear, kisses his darling mother, and heads on down the rocky road to America, never to return. Soon after leaving his home in Ballintur Killowen, County Down—and probably on the crossing to Liverpool—William re-instates the O' in front of the Anglicized version of his name. My sister recently tested the autosomal DNA of a cousin on our mother's side. A person inherits autosomal DNA from both their mother and father, unlike y-DNA which comes only from their father. ... When you put my family's paternal Hamilton y-DNA results and our maternal O'Rourke y-DNA results side by side, something doesn't really make much sense. 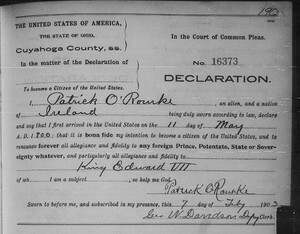 Summarized: I, Patrick O'Rourke, a native of Ireland, arrived in the United States on 11 May 1900. It is my intention to become a citizen of the United States. In this, as it turns out rather long, article, we are going to start in 1901 and walk ourselves back through the Ballintur records, looking only at the Rourke families, trying to trace each family back as far as we can. I finally broke down and paid for a few marriage and death records for my Irish ancestors from Northern Ireland. Here they are, all from the General Records Office of Northern Ireland. As mentioned in the last article, the results have come back for my cousin's autosomal DNA test at FamilyTreeDNA.com. Before I talk about the DNA test results, a little background. When I first started researching my family the only thing I knew about my maternal grandfather's grandparents were that they were named James Rourke and Ann Colgan. My sister called my atttention to the fact that our O'Rourke family rented 16 acres of Ballintur in 1864, according to Griffith's Valuation. This was a parcel twice as big as almost everyone else. 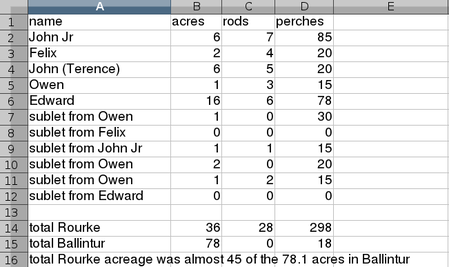 I decided to take a closer look at the land records. My aunt Theresa "Tiny" O'Rourke, went back to Killowen about 1960 to visit her relatives, presumably her aunt Elizabeth. 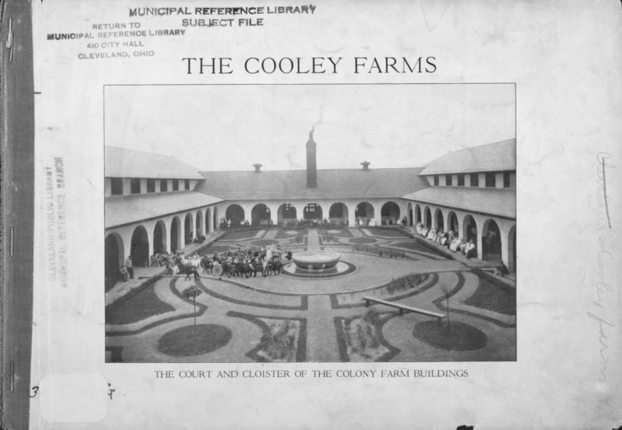 When Tiny returned she said that the O'Rourke property "ran down to the Irish Sea. We were tested on 67 markers the first time, and on 37 markers the second. Here are the facts. I don't know what conclusions to draw, but I will give it a try afterward. 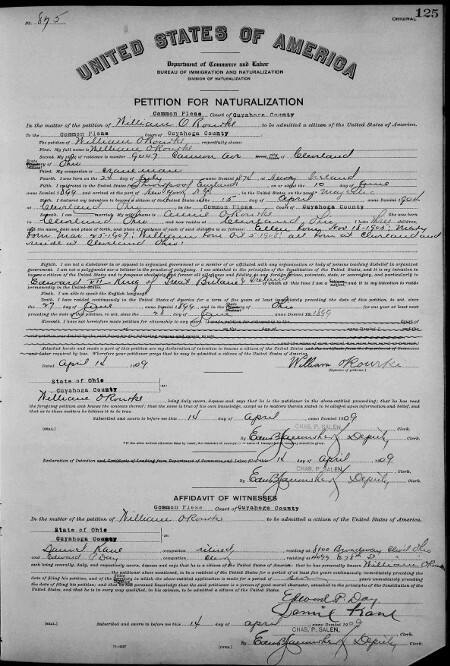 A transcription of William O'Rourke's petition for naturalization, April 14, 1909 and other naturalization papers.